In 2016 Apple introduced the iPhone 7 with wireless headphones and without a headphone jack, a move that, while criticised at the time, has now been widely imitated. It aligns with the efforts of designers in recent decades to eliminate the presence of tangled cables from our lives. In the name of convenience, a clean design must be small, light and portable with only the most essential physical features. 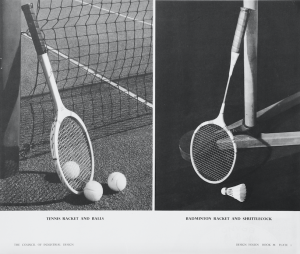 A stripped back aesthetic is instinctively imagined as one in which any evidence of functionality is a hindrance that must be hidden. 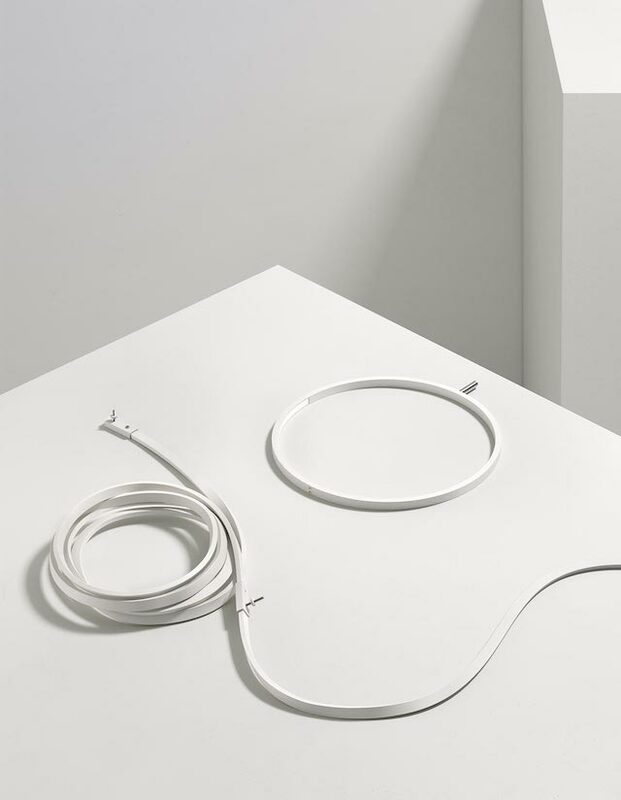 In an effort to see the move towards a wireless existence from a unique perspective, Andrea Trimarchi and Simone Farresin, the design duo behind Studio Formafantasma, have introduced WireRing, a new lighting system for Flos that reduces the object at the same time as it brings its essential components to the fore, all with a stylish flourish. 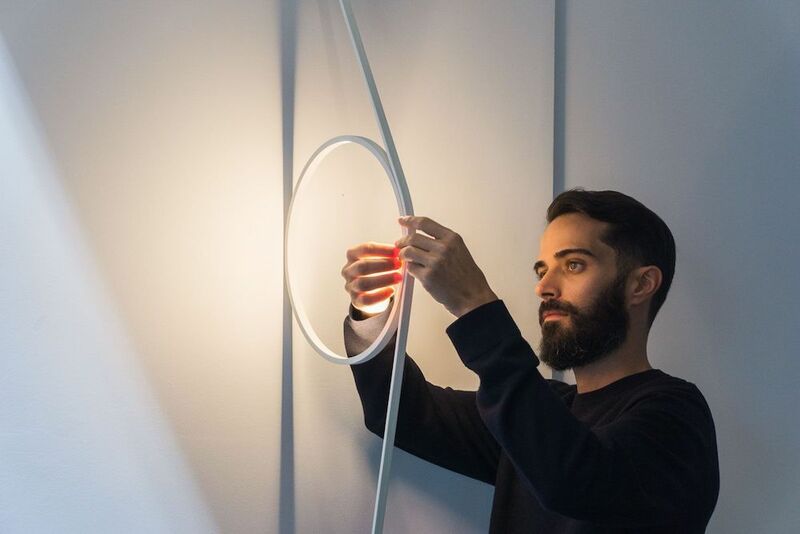 Enclosing a ring of LED strip within the electric cable required to transmit energy, and then suspending it from a wall using ABS joints, the designers produce a minimalistic lamp with an indirect glow that doubles as a smart sculptural feature in its own right. 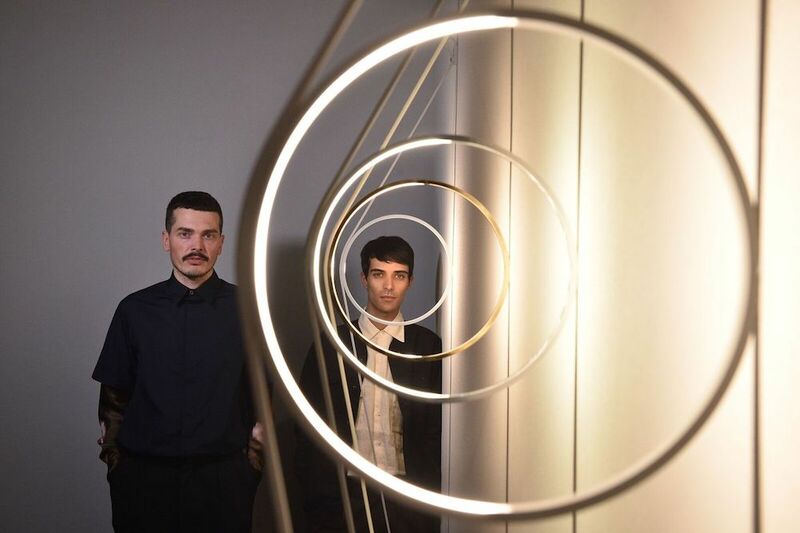 Here, Farresin speaks to Port about how he and Trimarchi came together as Formafantasma, their unique, concept-driven approach to design, and the freedom that lighting design can offer. How did you come together as Formafantasma? Andrea and I met in Florence. We were studying our bachelors, started hanging out and realised we wanted to work together. We applied as a duo to the Design Academy in Eindhoven for the master’s program and since then we’ve started working together. We graduated at the end of 2009 and immediately opened our studio. Formafantasma means the form of a ghost. 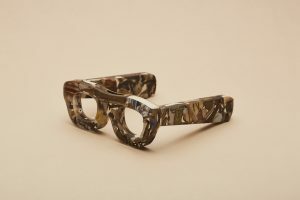 It is a reference to the fact that the form is not the most important part of our work – it’s much more about the process and the idea and research. Often we think the process is more interesting than the final outcome. So you could say we have a less formal attitude to design than others, that our success is derived more from a conceptual approach. How has your practice developed over that time? It has changed in many different ways. Our practice has always been based in material explorations but we have become more disciplined. 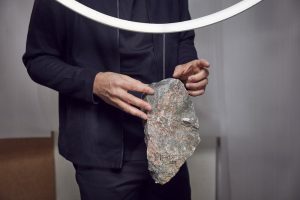 It’s about experimenting as well as focusing on the complexities and impact of design – we recently did a project exploring the recycling of electronic waste, how the industry of works and what we can do to improve it. We’ve also focused more on commercial projects and collaborating with our partners. Flos falls into that. We were trying to work out what we can do within the industrial design sector, started working with lighting, and realised that it was something we were very interested in. What interests you in lighting? It’s several things. In recent years working with lighting has become much more interesting with the introduction of new technologies like LEDs. You are able to do something much more innovative than with, say, furniture design. Light is not only about form – it’s much more about what you do with the light. It’s this immaterial thing but is also very expressive and important to people. A sofa has to look like a sofa but, if you are a good designer, a light offers a much larger degree of freedom. How did the specific idea for WireRing come about? We did an experience in Milan many years ago where we showed many different experimentations into lighting. Through that research we came up with an idea based around our interest in indirect light – the way it interacts with architecture – and also wanted to do something as reduced down and minimal as possible. 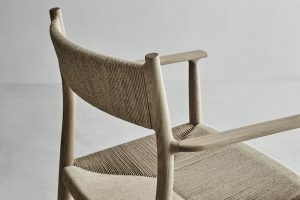 It’s not that we consider ourselves as minimalists but we wanted to achieve a timelessness and reduce the impact on the environment in its shipping and even its production. We started working on the idea of the bulb and cord – the electric cable in old fashioned lighting systems. 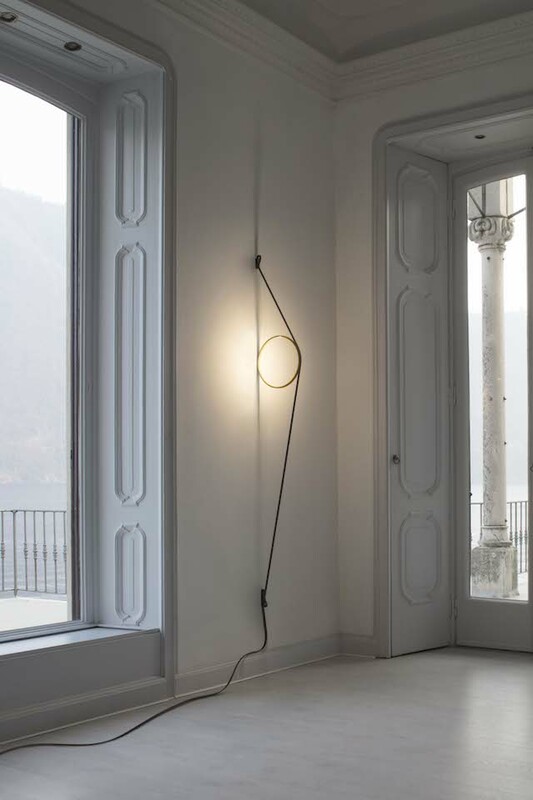 We wondered what that could mean in the age of the LEDs and this whole new light came about: one light source and one cable, the usually neglected part of a light which now becomes the lamp itself.